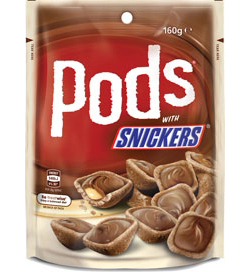 Crunchy wafer in the shape of a shell, filled with Snickers crème and topped of with smooth and creamy milk chocolate. This all creates an array of textures and flavours that keep your taste buds guessing. Sugar, Milk Solids, Flour (sources include Wheat), Palm Fat, Cocoa Butter, Peanuts (6%), Cocoa Mass, Emulsifier (Soy Lecithin), Cocoa Powder, Salt, Natural Flavour (Vanilla Extract). Had these in Australia and they are yummy.. These are the best things that I've ever had. I am from the USA and they aren't here so I have to order them here. If you haven't tried them you NEED to.